Broccoli sprouts, germinated seeds of broccoli that have a radishy taste and look similar to alfalfa sprouts, may improve survival rates of bladder cancer patients, help protect skin cells from sun damage, and potentially boost liver detoxification. They also have among the highest concentrations of sulforaphane, a dietary component of cruciferous vegetables that has been shown to benefit autism and suppress the ability of breast cancer stem cells to form tumors. Cancer cells can use epigenetics against us by silencing tumor-suppressor genes that could otherwise stop the cancer in its tracks. A number of chemotherapy drugs have been developed to restore our bodies’ natural defenses, but their use has been limited due to their high toxicity. There are, however, a number of compounds distributed widely throughout the plant kingdom—including beans, greens, and berries—that appear to have the similar effects naturally. For example, three hours after eating a cup of broccoli sprouts, the enzyme that cancers use to help silence our defenses is suppressed in our bloodstream to an extent equal to or greater than the chemotherapy agent specifically designed for that purpose, without the toxic side effects. Cancerous stem cells may be why breast cancer can return, even up to 25 years after being fought off successfully the first time. When people are told that they are cancer-free, it may mean their tumors are gone, but if their stem cells are cancerous, the tumors still might reappear many years later. Johns Hopkins University researchers asked women scheduled for breast reduction surgery to drink broccoli-sprout juice an hour before their procedure. After dissecting their breast tissue post-surgery, the researchers found evidence of significant sulforaphane buildup. In other words, we now know that the cancer-fighting nutrients in broccoli sprouts do find their way to the right place when we swallow them. Broccoli sprouts are compared to “Broccomax” supplements. 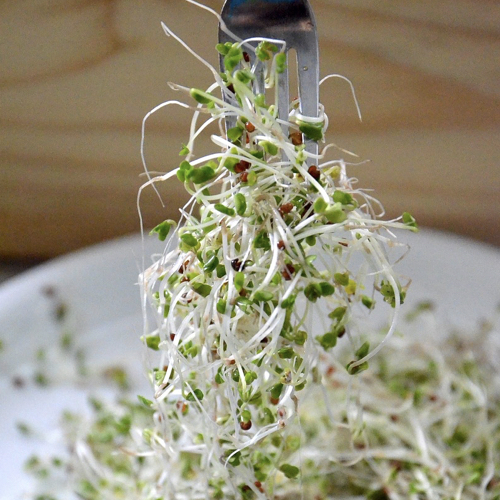 Four cups of broccoli sprouts a day may exceed the safe dose of the cruciferous phytonutrient sulforaphane.